Attendees receive information at the Keiro Caregiver Conference at the Gardena Valley Japanese Cultural Institute. GARDENA — More than 200 people filled the main hall of the Gardena Valley Japanese Cultural Institute (GVJCI) for the Keiro Caregiver Conference on Oct. 28. Dr. Glen Komatsu discusses palliative care resources. 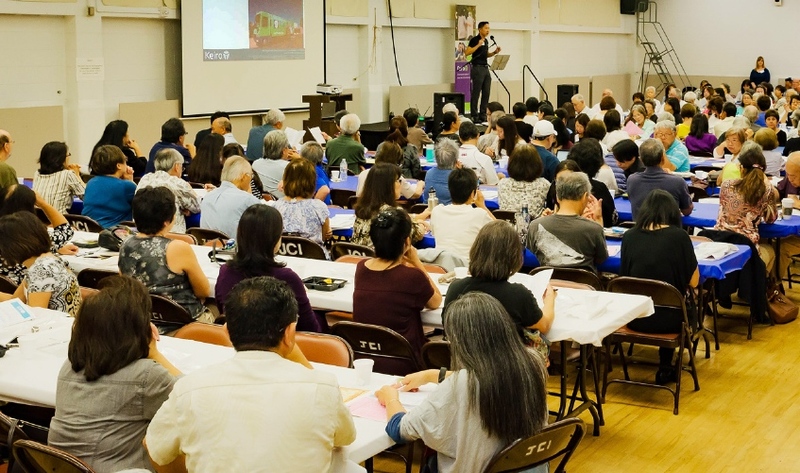 Keiro, in partnership with GVJCI, capitalized on the theme, “It’s a personal journey…,” with a schedule of speakers and panelists presenting on timely topics on providing for older adults and their caregivers. The program included statements from both Alison Kochiyama, executive director of the GVJCI, and Leona Hiraoka, president and CEO of Keiro. Kochiyama shared her own caregiver experience, noting that while caregiving is a difficult job, caring for her mother was a precious time and a true privilege. 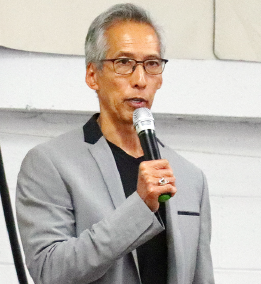 Hiraoka reiterated the importance of providing resources for caregivers and that caring for a loved one isn’t a single individual’s job, but the responsibility of a community. Christina Irving, LCSW, and Glen Komatsu, MD, the conference’s keynote speakers, provided valuable information and support to the attendees. Irving spoke about resources for caregivers to ease the burden of caregiving on themselves and reinforced that asking for help from those around you is critical to managing caregiver stress. Komatsu offered insight on the benefits of palliative care, highlighting Iyashi Care, a partnership program between Keiro and Providence Health & Services, Southern California. He emphasized the importance of whole person care, considering the person’s values, preferences, and priorities when making decisions. Free health screenings provided by Independence at Home, a Division of SCAN Health Plan, and free consultation appointments with legal, pharmaceutical, and social worker professionals were available to conference attendees following the breakout sessions. Keiro is a mission-driven organization engaged in improving the quality of life for older adults and their caregivers in the Japanese American and Japanese community of Los Angeles, Orange and Ventura counties. It delivers a wide range of resources to address the challenges and barriers that aging presents: isolation, limited financial resources, complex health conditions, and cognitive and memory disabilities. Keiro also partners with companies and organizations that can expand its services and ability to reach seniors and caregivers, and participates in research and innovation work where Keiro can contribute to advancing progress in resolving the challenges of aging. Keiro is headquartered in Los Angeles. For more information, visit Keiro.org.